India rewrote quite a few records on the tour Down Under which started with their first-ever Test series triumph and ended on a high when they clinched maiden bilateral ODI series victory against Australia in their own backyard. After losing the first match at Sydney Cricket Ground, Kohli’s men bounced back strongly to win the next two at Adelaide Oval and Melbourne Cricket Ground respectively, thus becoming only the second team in the last 30 years to win both Test and ODI series in the same tour of Australia. With only a few months away from the 2019 ICC Cricket World Cup, India look well-oiled and prepared and have ticked most of the boxes going into the mega event in England and Wales. While India were hampered with the non-availability of few players due to off-field controversies, most of the other contenders who might be a part of the squad for the World Cup were given few games to prove themselves in the 3-match ODI series. Let's focus on one such option who was tried only in the final ODI at MCG which was a bit surprising to quite a few experts considering Australia's weakness against leg spin. Yes, I am talking about Yuzvendra Chahal, who replaced left-arm chinaman Kuldeep Yadav. Talk of making the most of every opportunity, the wiry bowler grabbed it with both hands as he bamboozled the Aussie batsmen with flight and guile. His 6-wicket haul was not only match-winning but also good enough to win him the man of the match award. 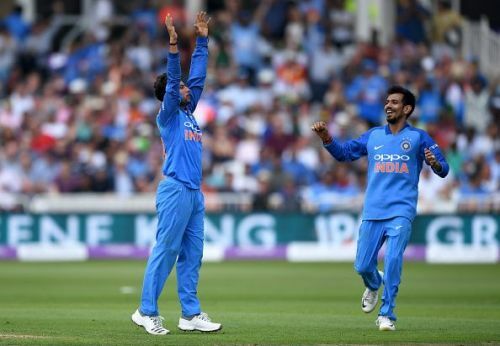 While the balance of the side is important in ODIs, India should look to accommodate both the wrist spinning option in the XI during the World Cup. Here are the three key reasons why this could prove the difference for men in blue.